Every auto shop worth its salt needs an air compressor, but not everyone realizes that it's not just tank size and motor horsepower that determine the value of your compressor. There are different types of air compressors: reciprocating, rotary screw, scroll, rolling piston and more. Some use oil for lubrication and others are oil-free. So, which should you pick, and what makes a rotary screw air compressor unique among the rest? There are many opinions on this subject, but there are some clear benefits with a rotary screw air compressor. Reciprocating air compressors come in lubricated and non-lubricated varieties (the former using oil or water as the lubricant). As a general rule, they're a bit clunkier and heavier than rotary screw compressors, because they have more moving parts, especially due to the reciprocating piston(s) driven by the complex crankshaft. A rotary screw compressor, on the other hand, is much simpler. It features a rotary-type positive-displacement mechanism that uses fewer materials. The system also lasts longer without needing maintenance. The male-female rotating "screws" do an exceptional job of sealing in lubricating oil, which results in an oil carryover that's less than 3 parts per million (a negligible amount). Your shop air will be cleaner and drier, making rotary screw compressors superior to other types for situations that demand low air moisture and the absence of oil particulate. 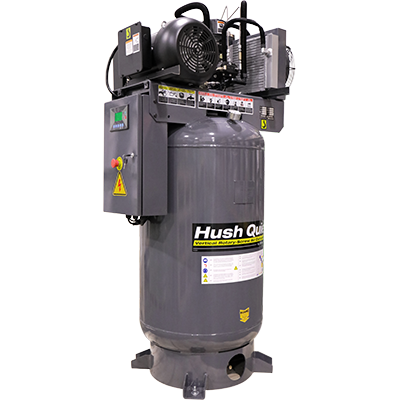 BendPak offers the Hush-Quiet rotary screw air compressor, which offers a 7.5 HP output. We also offer reciprocating compressors that feature 7.5 HP motors. Even though both designs have a similarly rated motor, they run at very different temperatures, and the rotary screw is the clear winner in this regard. Our Hush-Quiet runs at a mere 176°F (80°C) in normal conditions. This keeps the compressor running longer with less maintenance, and it means real savings for you over years of ownership. Unlike reciprocating air compressors, a rotary screw can operate continuously. Some reciprocating models will be rated as "100% continuous," but in reality, constant operation would wear out the pistons. It's best to let the pistons rest and cool for at least one-third of the amount of time that the compressor is turned on. In other words, if you run the compressor for 30 minutes, let it rest for 10 minutes. A rotary screw runs at a lower temperature, so overheating is not much of a concern. It can run all day long without wearing out critical components. This is a significant factor for shops that require a steady stream of air. At the end of the day, an air compressor is simply another tool that helps get the job done, and unfortunately, these tools are usually very loud. Rotary screw compressors have changed that. They're barely louder than a vacuum cleaner or dishwasher, so you can still have conversations and not feel like your head hurts when you're near one. There are many benefits to a rotary screw compressor, so let us know if this guide helps you pick the best one for your shop. BendPak's Hush-Quiet is an industrial-grade powerhouse, offering significantly reduced noise levels with a whopping 7.5 HP design fit for most automotive applications.